Veneers aren’t just for models and movie stars. You can get a near perfect smile with their placement over your existing smile. These thin sheets of porcelain are placed as a shell over a tooth that’s damaged or irregular to create a uniform, bright tooth. They create a natural-looking smile and strengthen your teeth. 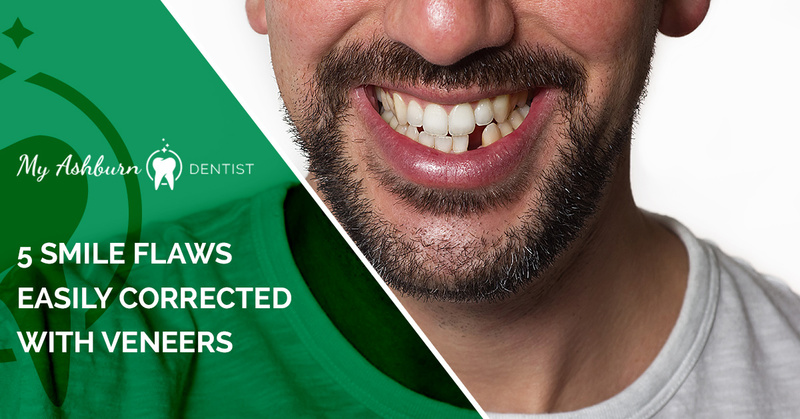 Dental veneers fix a number of tooth irregularities. Read on to learn about five of the most common corrections they provide. You might have chipped a tooth due to an injury to the face, a sports injury, car accident, or sudden fall. The veneer restores the full shape of the tooth, so no one ever knows the accident happened. It’s shaped and sized to fit perfectly over your existing tooth. The dentists also match the coloring to your natural teeth, so it doesn’t stand out. Irregular shaped teeth may be too small, or large, or have craters or bulges. Placement of veneers can make these teeth look more uniform. To place a veneer, the doctors file down a small portion of your existing tooth for the overlay to fit. A tooth that’s too large can be filed down to a size that matches other teeth, or one that’s too small can be built up by the veneer. You may develop gaps between your teeth due to thumbsucking as a child, genetics, or gum disease. Veneers can correct minor gaps between your teeth, without the need for years of wearing aligners or bulky braces. If your teeth have yellowed due to food habits, tobacco, or aging, you can usually achieve whiter teeth with the application of hydrogen peroxide solutions. But teeth that are grey or brown due to root canal treatment, stained from tetracycline or other drugs, excessive fluoride, trauma, or severe decay don’t respond to traditional chair-side or at-home whitening efforts. Placing a veneer over the darkened tooth brightens it to match the rest of your smile. Your teeth gradually wear down with time, but clenching or grinding your teeth accelerate the process. Habits, such as chewing ice or your fingernails, long-term exposure to acidic drinks – including coffee and soda – or severe tooth decay can also contribute to excessive tooth wear. Severely worn-down teeth look flat and short and may appear more yellowed. Porcelain veneers restore the original shape and color of your teeth to enhance your smile. To be a candidate for veneers, you must be in overall good health and have healthy gums and teeth. Veneers are a permanent solution to smile flaws and last anywhere from 7 to 15 years, depending on how well you maintain them. After this point, you’ll need to replace them to keep your smile shining and the teeth protected. You don’t have to do anything special to maintain the appearance and health of teeth that have veneers. Basic oral hygiene, such as brushing, flossing, regular professional cleanings, and twice yearly checkups promote a healthy mouth and long lasting veneers. If you’re considering veneers as a smile solution, contact My Ashburn Dentist for a consultation and expert placement.